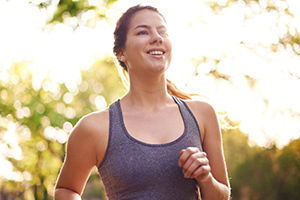 You’ve made your resolution: a healthier and happier 2016. If you have goals to treat your body better this year, Crepe Delicious can help you stay on track with our menu. Packed with healthy crepe options and a ton of variety, you won’t be bored or sacrificing flavour or time to stick to your resolution. Let Crepe Delicious help you meet your goals this New Year! Crepes can be healthy if garnished with the right toppings, ingredients, and fillings. Healthy ingredients include vegetables like tomatoes, onions and mushrooms. Match your favourite vegetables with greens such as lettuce and spinach. Better overall health: Beat the common cold faster, boost your immunity, and keep your body in good working order by eating a balanced diet full of fresh and healthy food. Lower risk of disease: People who maintain a good diet are less likely to develop heart disease, diabetes or other conditions that can have a major impact on your health later on in life. Sometimes you still need a quick lunch, though. If you need something to eat on the go, don’t feel guilty about having one of our Savoury Crepes such as the Popeye Crepe or Chicken Caesar. A healthy body weight: Changing to a more nutritious diet won’t have you missing any of the flavour of unhealthy, processed foods. Healthy foods are delicious and have been gaining popularity due to great flavours, adding incentive to eat better. Feeling and looking better: Your skin, eyes and hair will all look brighter and more attractive by fueling them from within. More energy: Get a kick-start to your morning by eating a balanced breakfast. It will help keep you energized throughout the day. In a rush? You can still start off your morning right by grabbing a Florentine Breakfast Crepe, full of healthy ingredients like spinach and mushrooms. Stronger muscles and bones: Not all the benefits of healthy eating will be as noticeable. Over time, however, you will be enjoying the strength and resilience of strong muscles and bones that comes from feeding your body well. More and more casual fast food consumers are now ordering low-calorie or healthy options more often than they did in the past. Crepe Delicious has taken notice of this trend and has made offering our customers healthy, nutritious options a priority. Come find out why more people are making the choice to visit healthy fast food restaurants such as Crepe Delicious over the typical choices. 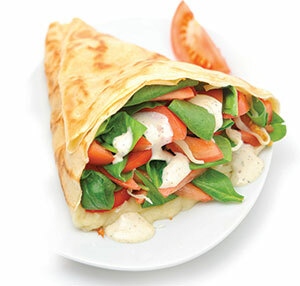 If you are looking for a fresh, healthy alternative to fast food, come into Crepe Delicious and see all of our wonderful healthy crepe options. Find a location near you and try your favourite crepe.